The fall of the Berlin Wall prompted the more optimistic proponents of globalisation to hail the advent of a new "borderless" world. Two decades later, however, borders and boundaries have acquired a political importance not witnessed even during the hottest period of the Cold War. Matt Carr considers why this has happened. The tabloids love this stuff, and on one level Cameron’s announcement was designed to provide his party with a little instant political gratification at a time when his government is floundering on the reefs. But his crowd pleasing suggestion that Britain’s borders could be closed to prevent an influx of refugees that may never even happen also contains a paradox that is intrinsic to the politics of the new century. For much of the Cold War, the governments that made up the ‘free world’ routinely condemned the ‘closed borders’ of the Soviet Union and its satellites in Eastern Europe that prevented their own citizens from leaving. Such condemnation was generally accompanied by a willingness on the part of those same governments to accept migrants from the Soviet bloc, regardless of whether their motives were political or economic. If these outward journeys were a vindication of the political and economic freedoms available in the West, the heavily-guarded and militarised borders of the Warsaw Pact and the Soviet Union were frequently depicted as a confirmation of their insularity and repressiveness – and also as an infringement of a basic human right to freedom of movement. The most visible symbol of the closed borders of the Soviet bloc was the Berlin Wall. In 1987 Ronald Reagan famously exhorted Mikhail Gorbachev to ‘tear down this wall’ during a visit to Berlin as proof of his commitment to perestroika. Gorbachev did not respond to this request, and it wasn’t until two years later that the wall was dismantled by Germans on both sides. The collapse of the Soviet bloc coincided with – and to some extent was caused by – the triumph of a new globalised neoliberal economic model, which appeared to have transcended the process of ‘national’ capital accumulation of the last two centuries. For this reason, the more utopian proponents of globalisation celebrated the advent of a ‘borderless’ world in which national boundaries would become obsolete and there would be no barriers against the free movement of capital and goods, with some arguing that the same freedom should be granted to people. In the two decades that have followed the collapse of the Soviet Union, some of these predictions have been fulfilled. On the one hand, various countries have entered into political and economic arrangements that have transcended or softened national boundaries, most notably in the European Union and the creation of the Schengen Area. The City of London and the British banks which Cameron promised to protect last week by closing the border have benefited enormously from these ‘borderless’ capital flows. Yet it is precisely in this period that the notion of the ‘UK border’ has become a political obsession, in which successive governments have competed with one another in their attempt to demonstrate their ability to ‘secure’ or ‘protect’ it from the unwanted consequences of global economic integration. This fixation is not unique to the UK. Across the world the same countries that ‘won’ the Cold War have militarised their borders and introduced an ever-escalating array of technologies and procedures aimed primarily at monitoring, detecting and preventing the unauthorised entry of ‘illegal immigrants’. In the United States and Israel, at Spain’s North African exclaves in Morocco that constitute the southern borders of the European Union, in Greece and Slovaka, governments have erected ‘walls’, fences and physical barriers at their borders. In Australia in the late 1990s the government began to deploy the navy to repel asylum seekers trying to cross the Pacific. 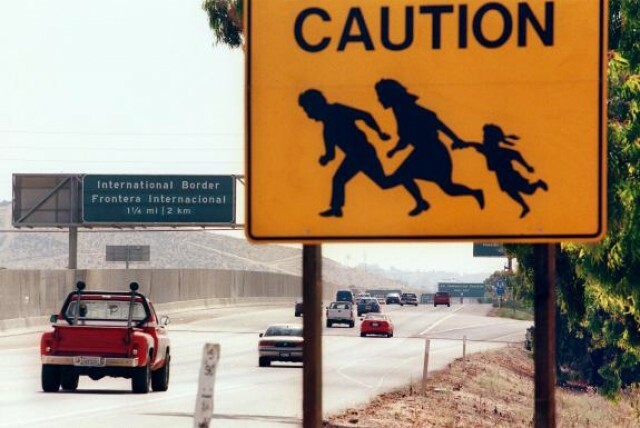 Ever since the Clinton administration began to reinforce the US-Mexico border in the early 1990s, successive governments have poured money into border enforcement in a largely futile attempt to seal off the border, which has had little practical consequence except to increase the number of migrant deaths. Today, border enforcement is no longer limited to the territorial border itself. It extends outwards, through ‘pre-entry’ and ‘externalised’ border controls that aim to prevent unauthorised entry long before unwanted migrants get anywhere near their desired destinations, so that the border becomes ‘the last line of defence rather than the first’. The border also extends inside the national territory, in the form of deportation and detention programmes, identity spot checks and raids on workplaces, all of which reinforce the distinction between ‘aliens’ and national citizens, between legal and illegal, between rich countries and poor countries, between them and us. On one level, borders have become symbols of an exclusive version of national identity that is perceived to be imperilled by immigration from supposedly alien and ‘unassimilable’ immigrants who are not – and never can be – ‘like us.’ But the new politics of identity and belonging also represent a deeper attempt to reinforce and confirm the privileges that stem from national citizenship, even as such privileges are being progressively unravelled and dismantled by the same ‘borderless’ economic forces that have called the integrity of the nation-state into question. In this sense then, the notion of ‘our’ border has a powerful symbolic resonance. At a time when the world is perceived to be more dangerous and insecure as a consequence of global economic integration and the new global mobility, borders have become barriers against an ever-widening array of threats that include terrorists, transnational criminal networks, smugglers and human traffickers – and now Greeks. Last but not least, the border has become a kind of political theatre, where governments attempt to win kudos for themselves through their ability to keep unwanted people out – or score points by pointing out the failure of their opponents to do so. These efforts to circle the wagons at the frontier have not stopped undocumented migration, though they have succeeded in transforming ‘illegal’ migration into a deadly gauntlet where migrants are exposed to violence, exploitation and death. Rather than address the inevitability of migration, or its deeper motivations and consequences, the governments of rich – and some poor countries – have committed themselves to an exclusionary model that fails to address its deeper motivations and the structural inequalities in the global economy that underpin it. Intended – by some governments at least – to ‘manage’ migration, the rhetoric of border enforcement and border security has tended to reinforce the general perception of (poor) migrants as criminals, dangerous people and parasitical intruders. They have also exacerbated the sense of vulnerability and insecurity in the countries that have erected these barriers, in which hysterical perceptions of an unstoppable ‘flood’ of migration alternate with a ceaseless search for new modalities of exclusion – regardless of their consequences for those who are excluded. In the brilliant dystopian Mexican film La Zona, the middle class inhabitants of a ‘gated community’ in Mexico City attempt to seal themselves off from the corrupt and disordered society around them behind impregnable fences and CCTV. But their fear and hatred of the outside world also traps them and makes them paranoid, callous and vicious. Today, the militarised borders adopted by so many governments threaten to bring about a similar transformation. Products of paranoia, selfishness, racism and xenophobia, the new ‘hard’ borders of the 21st century represent a ‘gated’ response to human mobility that has pandered to and inadvertently legitimised the worst instincts of the countries that have erected these barriers. Ultimately this exclusionary model is incompatible with the commitment to human rights, democracy, and accountability that these same governments espouse, and cannot succeed even on its own terms without transforming their countries into closed fortresses. To avoid this outcome, we need to develop a new relationship with the world-beyond-the-border, which does not punish the poor for their desire to move, which recognises migration as a permanent and inescapable consequence of the twenty-first century and emphasises solidarity rather than exclusion, which seeks to maximise the benefits of migration for the countries that migrants come from and the countries they go to. In the current climate that outcome might seem a little utopian, but it is still worth striving for and insisting upon, every time cynical opportunist politicians like our current Prime Minister promise yet another attempt to bolster ‘our’ border in order to make themselves look good. Has it ever occurred to you that the interests of people living within the borders ought to have a say in who can move in to their country? My name is Lily Shafroth and I am a research assistant for Professor Ronald Rael in the departments of Architecture and Art Practice at the University of California, Berkeley. He is currently writing a book, Recuerdos | Souvenirs: Memories of the U.S./Mexico Borderwall, an account of the Great Barrier that divides the United States of America from the United States of Mexico. I am inquiring about the rights of the photograph at the head of this article and seeking permission to use this image in Rael’s book. I would be happy to provide you with more information about the project and the professor or answer any questions you may have about use of the image.